The Brook Trout World Record is 14 lbs. 8 oz. Ok. Wake up! There’s better stuff coming up and you don’t want to miss it. Nestled in the small streams, lakes, and ponds of eastern North America, the brook trout waits for the angler. You can find them from the upper elevations of the Appalachians to the northerly parts of Georgia. From the Saint Lawrence/Great Lakes system and the backwaters of the northern portions of the Mississippi river all the way to eastern Iowa, the brook trout waits for your fly. These wonderfully sassy fish will grow to be around 10 to 16 inches in length and weigh up to 11 pounds. Not huge, but a nice catch nevertheless. Spawning is from October into the fall with the peak being in November. 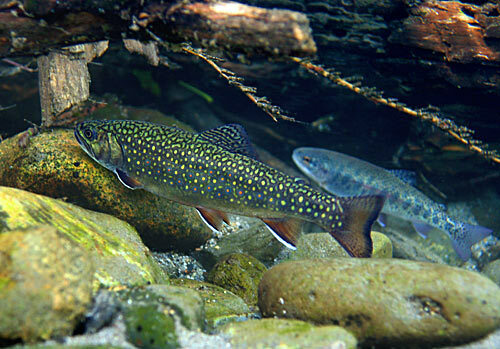 Brook trout usually are born in freshwater streams where the water runs colder and deeper than most trout species prefer. The female carves out a nest called the redd and lays 15 to 60 eggs. The female will cover the redd after the big, tough male fertilizes them, and then moves on to do it again. A single female will lay between 400 to 600 eggs. How many eggs are laid depends on the female’s size. The eggs will hatch the following spring. 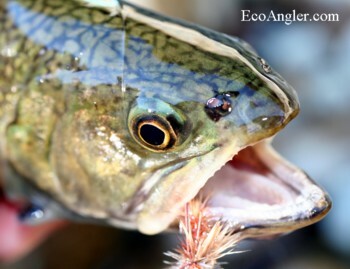 The brook trout is a carnivore and will eat just about anything that it can get its mouth around. They will feed on small microscopic crustaceans and insect larvae as alevin (hatchlings). As they mature and get larger, so does their food selection. Being opportunistic feeders, they will feed whenever they get hungry. Typically, a feeding frenzy will occur in the early morning and then again in the early evening hours. Be sure you match the hatch if you toss a fly. They may be fish, but they aren’t stupid. In a large pot, cook bacon. When bacon is crisp, remove and put aside. Toss the onions and peppers into the bacon fat, cover, and simmer slowly until vegetables are tender. Heat up some water and prepare chicken broth (read the directions, guys). Then put ALL the water in the pot. Add the okra, corn, rice, tomatoes, and Cajun seasoning, stirring as you do. Bring to a boil. Cook on low heat for about 15 minutes or until the veggies are softened and tender.Now add the trout and reserved bacon. Pour in lemon juice and cayenne. Salt and pepper as you like. 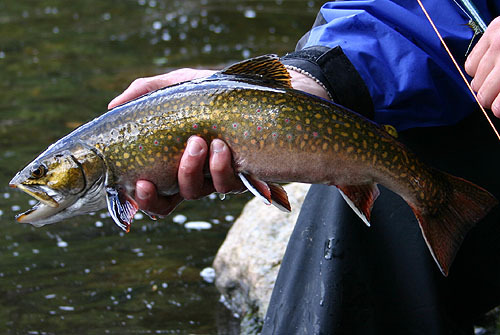 The brook trout is sometimes confused with the freshwater salmon. Except for the lack of the hook on the nose, this is an understandable mistake. The brook trout has spots as well where the salmon does not. And here’s a surprise; the brookie technically isn’t a trout at all, it’s really a member of the Char family. P.S. Since writing an article recently on East Tennessee Fly Fishing on the Watauga and South Holston rivers, I've had several questions about the brookie. The big question was which brook trout lure works best on these rivers. I can speak with authority having fished these rivers in July and can tell you that a large beetle (as the dry fly) and a #24 midge tied to the bottom of a dropper rig is a killer like no other I've ever used. So please try this set-up the next time you fly fish East Tennessee in the summertime. You will be glad you did.